The SuperMicro2 stems from my dis-satisfaction with the Tang Band W3-1364SA full range driver that I used in the first SuperMicro. Granted that the W3-1364 has a neodymium magnet, a cast frame, a bamboo cone and a phase plug but I expect something magical at $40.30 for a 3″ driver. Unfortunately, that is not the case. That got me searching for a cheaper solution. When I chanced upon a 3″ Fountek FE85 at $10.89 each, I said to myself “Why not”. The worst that can happen is an expensive paper weight. The plot in Fig 1 shows the FE85 used as a full range driver. It does look impressive at first sight in that the high frequencies extend up to 20kHz but having listened to it carefully, I noticed the treble exhibited some brittleness. It is perfectly fine for listeners who are not too fussy with sound but for hifi, this is unacceptable. Fig 2 is the Frequency Responses of the FE85 with a bandpass of 250Hz and 3.5kHz (24dB/oct). The cone breakup peak at 10kHz is suppressed to -35dB while the 18kHz peak is -40dB. The FE85 treble harshness has been vanquished completely. In it’s place is a Peerless BC25SC08 (Red Plot). The Blue plot in Fig 3 is the summed response of the FE85 with the BC25SC. When the BC25SC is wired in reversed phase, it created a beautiful, symmetrical notch at 3.5kHz (Brown plot). The shape of the null is an indication that the two drivers are very close to being time-aligned. The Violet plot in Fig 4 is from a compact 10″ Bandpass subwoofer with a vintage 10″ Pyramid Gold Car Subwoofer. The subwoofer is low passed at 250Hz (24dB/oct). Having such a steep slope is important because it totally suppresses the resonance peaks which would otherwise interfere with the midrange. Fig 5 shows the bandwidth when the SuperMicro2 is supported with the Bandpass Sub. The measurements below 500Hz are not very accurate because they include room reflections. However, it does show the bass extends down to 40Hz with the Bandpass Sub, crucial for music reproduction. Since the Pyramid Gold driver is no longer available, I switched over to the 8″ Toucan Sub. The Toucan uses a 8″ Dayton Dual Voice Coil Subwoofer, the SD215A-88. Crossover is the same at 250Hz. The response of the Toucan (Violet plot) in Fig 6 is very similar to the Pyramid Gold Sub. Fig 7 is the summed response of the Toucan with the SuperMicro2. As before, measurements below 500Hz include room reflections. As can be seen, the Toucan is a perfect substitute for the Pyramid Gold Sub. On playback, it sounds just as good. Fig 8 is a highly magnified (1.0ms) Waterfall plot of the SuperMicro2. Some artifacts are seen at 5kHz and 10kHz but they are quite inaudible. What is interesting though is there’s more intensity in the decay from 1kHz~3kHz. Fig 9 – SuperMicro2 Toneburst Energy Storage. Impulse Window = 5ms. The Toneburst Energy Storage plot in Fig 9 shows excess energy (the light blue slices) from 1kHz~3kHz. 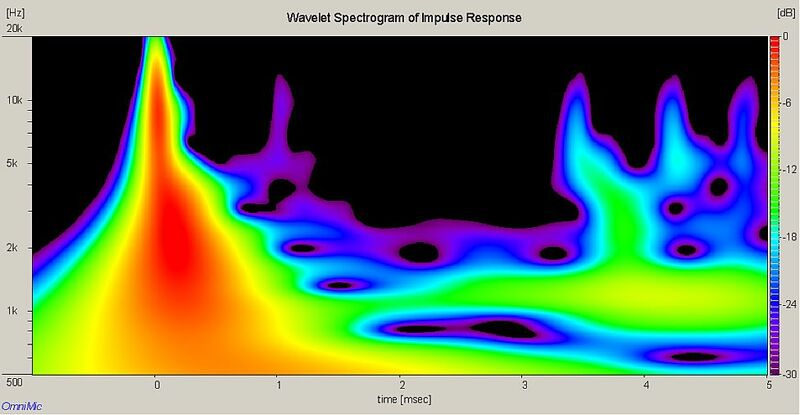 This is the higher intensity seen in the Waterfall plot. Farther up, there are some smaller excess energy emanating at 5kHz and finally a touch at 10kHz. Again, this correlates to the Waterfall plot. The Spectrogram in Fig 10 is a 2-dimensional representation of the SuperMicro2 response. The excess energy at 1kHz, the green strip, is seen extending to the right. The BC25SC tweeter response is actually very impressive. At 3.5kHz upwards, there’s only a small violet patch at 1msec. Note violet is -30dB. The larger patches at 4ms onwards are from the FE85. They appear to be some cone ringing as the FE85 is rolled off. The Red plot in Fig 11 is the 2nd order harmonic of the SuperMicro2. The Violet plot is the 3rd harmonic. Generally, the Distortion is -50dB below the fundamental except for a bump at 1kHz. It just so happens that this is where the anomalies are in the Toneburst Energy Storage plot and the Spectrogram. Fortunately, this distortion is only +6dB and 2nd harmonic. Having tested out the Fountek FE85, it is a much better buy over the Tang Band W3-1364SA. The FE85 cost a quarter of the W3 but soundwise, it performs exceedingly well when it’s supported by a tweeter. In playback, the SuperMicro2 sounds like a speaker with a flat response. The vocals are not recessed nor are they so forward that they sound unnatural. The treble is flawless. Completely free of any harshness. When the SuperMicro2 is mated with the Bandpass Subwoofer at 250Hz, the music is impressive. Now it sounds like a good hifi system. Great for music while you work. I find it relaxing in that it doesn’t distract me from what I’m working on. Hence, the SuperMicro2 is perfect for businesses like restaurants and boutiques where high quality background music is used to enhance the environment. It’s best to run the SuperMicro2 in an active tri-amped system. A passive system is impractical as the cost of the components for a 24dB Linkwitz Riley passive crossover will far exceed that of the drivers. On top of that, there’s no space inside the SuperMicro to house the crossover. There are a fews things about this tweeter that need to be noted. One is the sensitivity. It is very high, which is a plus. The minus is the crossover frequency. It doesn’t do well below 3kHz. This is due to the astoundingly high Fs. I recorded it at 1.8kHz with DATS. It may well be possible at 2.5kHz (24dB/oct) with a conjugate network to flatten the resonant peak but I have yet to try that. Apart from this weakness, the BC25SC08-04 is an outstanding tweeter.